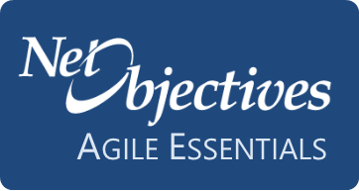 Visit Net Objectives Essentials to learn how Net Objectives provides a support system, online training and a train-the-trainer program to help support your COE. A Center of Excellence (COE) is a team, a shared facility, or an entity that provides leadership, best practices, research, support and/or training for a focus area. The focus area might be a way of working together (such as with Guardrails), a business concept (such as Minimum Business Increments), a skill (such as Acceptance Test-Driven Development), a framework (such as Scrum) or a broad area of study (such as Agile). A center of excellence may also be aimed at revitalizing stalled initiatives. More and more companies are creating COEs to guide their Agile transformations. Here are some of the responsibilities of a COE. COEs are typically understaffed. As a result of this, many COEs tend to adopt frameworks that provide them with both materials and certified individuals to assist their endeavors. This increases both capability and capacity. However, since no framework is a one-size-fits all, this is not a complete solution. In addition, while hiring/contracting people with certification can feel comforting, a two to four day course is not in itself great expertise. It also tends to focus people on the framework as a guide. The COE must still step in and add the deeper knowledge required. While not shown in the diagram, management’s role in tying all of these pieces together is a key aspect. 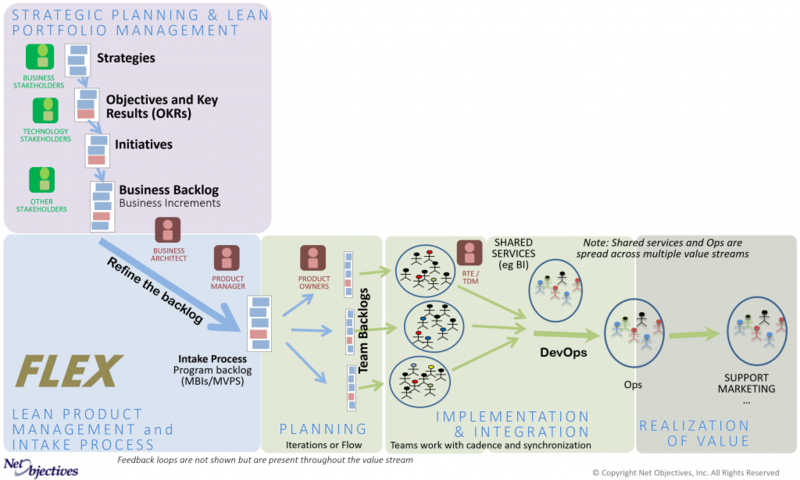 The value of using an operating model instead of a framework is that one can then use different frameworks (such as Scrum and Kanban) across the organization so that people can use what works for them but implement it as fits them. COEs should create a common vision for the entire value stream – even if it doesn’t directly support each part of the value stream. By identifying the objectives consistency can be achieved while enabling different parts of the organization implement it in their own way. Frameworks can be a core part of this (e.g., SAFe). With set objectives groups with different skill levels can work in the way that suits them while achieving a degree of consistency. One of the central tenets of Lean is that the system people are in impacts them significantly. This does not mean, however, that one can just create a new system and put people in it. Lean Thinking suggests systems support people but it also presumes they are capable of getting their work done. Putting people into a potentially Agile system does not teach someone actual Agile skills. In fact, it often slows its adoption down because people may resist the added ceremonies at worst and at best much of their energy available for learning is now being focused on the framework and not the actual skills required. The application of a framework to create a better environment only works if skills necessary to support the intention of the framework are included with the framework. Unfortunately, providing both simultaneously has the great risk of overloading the individuals in the organization. The likely result will be a focus on the framework without actually learning the new skills. This may end up becoming a burden into and of itself. You must implement Agile in an Agile manner, providing core Agile skills with the core framework – adding both as time goes on. This is where an operating model can be useful as it enables the adoption of frameworks in a manner that fits the company. At a minimum, COEs should provide the intentions of the different roles in the organization. The enables greater autonomy as depicted in Figure 2. Collaborate with each other in order to maximize the realization of Business value across the enterprise. While there is value in consistent outcomes, forcing them to be achieved the same way across an organization is not only misguided, it is futile. There is no one size fits all. But there can be consistent intentions across the organization. In most organizations, people are working at or beyond capacity. The true cost of learning is the time it takes for people to actually learn something and the cost of not learning it because they are too busy. As much self-paced training that can be provided should be. Many skills, such as object-oriented development or being a Scrum Master, have online training programs available to organizations at fairly low cost. Learning over time while on the job has proven to be an effective method of learning. Train-the-Trainer programs have the advantage of having instructors know the context within which the training is taking place. However, this is taught by using generic slide decks. Furthermore, a two to four day course does not a trainer make. A “Train-the-Trainer” program must take someone already competent in a skill and teach them how to teach. This is typically done via them watching a delivery, co-teaching with an experienced instructor, and then them being observed by an experienced instructor.